African dwarf frogs are usually low-maintenance pets but they are still living creatures who can get a plethora of diseases. Dropsy, or bloat, is one of those diseases that most often affects African dwarf frogs. Dropsy can also affect may other frog species that are kept as pets. The word dropsy is technically another word for edema. If your exotics vet refers to frog dropsy as edema, hydropsy, bloat, or ascites, they are probably referencing the same thing. Dropsy (edema, hydropsy, ascites, bloat) presents as severe bloating in your pet frog. 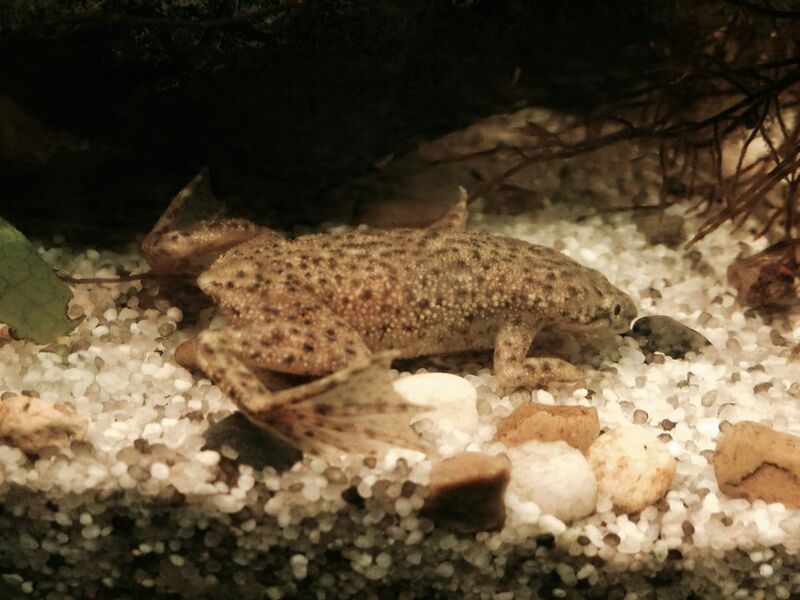 Your African dwarf frog may look like a balloon that will just float away if given the opportunity, but they are not filled with air. The reason why your frog is so bloated is due to all the fluid that has built up inside their little body. This fluid may even have seemed to appear overnight and makes your frog very uncomfortable. The disease process of frog dropsy isn’t fully understood, meaning we don’t really know what makes a frog get dropsy. But we do know that this edema is caused by the lymphatic system. In the case of frog dropsy, lymph, the fluid substance that circulates in the lymphatic system, fills the lymph nodes (and does other jobs inside the body), does not drain properly, builds up outside of the normal tissues it usually stays in, and fills the abdominal cavity of a frog, thus causing the edema. How Is Frog Dropsy Diagnosed? Of course, never assume your frog has dropsy without first consulting an exotics vet. There may be another reason why your frog is swollen. Sometimes frogs eat things they shouldn't eat, like gravel and rocks from the enclosure, and are actually impacted, not bloated from dropsy. A frog with dropsy usually appears to be inflated. A radiograph (x-ray) may rule out ingestion of a foreign object but often times simple palpation and inserting a needle into the frog's abdomen (belly) is enough to determine whether or not a frog has it. How Does Frog Dropsy Harm a Frog? Just like the pressure that fluid build-up puts on an eyeball with glaucoma, lymph fluid causes extreme pressure on almost all of the internal organs in a frog with dropsy. The kidneys, liver, spleen, and other organs suddenly have an extreme amount of pressure put on them. Imagine a water balloon, filled to the maximum and about to burst with water. If you overfill it, it will pop, rendering the balloon unable to do its job of holding water. Similarly, if so much fluid is pushing on an organ, it is so stressed that it cannot do its designated job. As you can imagine, and as anyone with glaucoma can attest, this extreme pressure is painful. It may cause your frog to be very lethargic and stop eating due to the discomfort and pain (and obviously a frog cannot survive without eating). Can Frog Dropsy be Cured? Since we don’t know exactly what causes dropsy we cannot exactly cure it. But we can definitely treat the symptoms. This often includes your exotics vet draining your African dwarf frog’s abdomen (belly) of the excessive fluid. This will alleviate the pressure put on the organs and definitely make your frog feel better almost instantaneously. Some people recommend adding salt to your freshwater enclosure to help a frog with dropsy but this is very dangerous. More often than not the salt kills your frog. The idea behind the salt is that it helps to draw some of the excess fluid out of your frog, but since African dwarf frogs are not saltwater amphibians, they usually die from the addition of the salt. What Can You Treat Frog Dropsy at Home? Unfortunately, there is nothing you can safely do at home to help a frog with dropsy. If you add salt to their enclosure you run the risk of causing a painful end to their life. If you try to drain the fluid yourself, you could puncture something that can’t be fixed. Therefore, this is a disease that requires some expertise. Euthanasia, unfortunately, may be an option discussed with your vet if they do not feel as though there is much hope for your frog. Can You Prevent Frog Dropsy? Since we don’t know what exactly causes frog dropsy it is hard to say how to prevent a frog from getting it. We do know that it is not contagious and some thought has been directed towards the electrolyte balance of the water causing the disorder. Regardless, it is never a bad idea to keep your water as clean as possible, remove the chlorine from the water, and test the pH to maintain a neutral level (7.0-7.2).